Click here to download the RMAH mobile app! ROPER MOUNTAIN ANIMAL HOSPITAL WAS THE 2009 BETTER BUSINESS BUREAU BUSINESS OF INTEGRITY FOR MARKETPLACE ETHICS AWARD WINNER FOR UPSTATE SOUTH CAROLINA! To care for your animal as if they were our own. We will do this through our compassion, caring, and genuine desire to see every animal as healthy as possible. We will try to practice the highest quality medicine and surgery possible and make sure that every animal gets the same level of care. 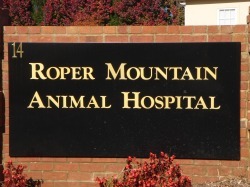 Roper Mountain Animal Hospital has been at 14 Roper Corners Circle since July of 2006. We specialize in dogs, cats, rabbits, rodents, and ferrets. We offer comprehensive pediatric, wellness, and geriatric care. We have a full in-house diagnostic lab and can run most lab samples within 15-30 minutes. We can do most routine surgeries (spays, neuters, soft tissue surgeries, etc) in-house and refer more complicated medicine and surgical cases to a nearby referral hospital if needed. Dental services are very important to our hospital. February and September are dental months which means there is a 20% discount on all dental procedures the whole month of February and September! After hours emergencies are referred to the Animal Emergency Clinic at 393 Woods Lake Road - 232-1878. We carry a full line of prescription diets including Hill's, Purina, and Royal Canin. If we do not have what you need then we can order it for you. We pride ourselves on our excellent customer service, high quality medicine and surgery, comprehensive dental care, and clean hospital. Please come check us out for yourselves! Roper Mountain Animal Hospital is the sole owner of the information collected on this site. We only have access to/collect information that you voluntarily give us via email or other direct contact from you. We will not sell or rent this information to anyone. We will use your information to respond to you regarding the reason you contacted us. We will not share your information with any third party outside of our organization, other than as necessary to fulfill your request. Unless you ask us not to, we may contact you via email in the future to tell you about specials, new products or services. If you feel we are not abiding by this policy, please contact us via telephone or email.